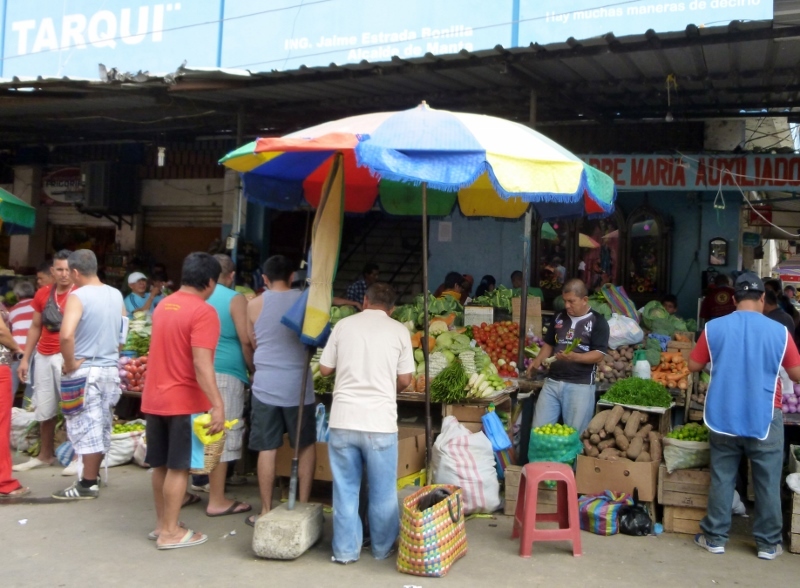 “It’s like déjà vu all over again.” The quote, often attributed to Yogi Berra, is the feeling we have as we wander through the vast market area known simply as Tarqui in Manta, Ecuador. It is, in ways, similar to the sprawling mass of shops and stalls in Merida, Mexico whose cacophony and turbulence would drive us back to Parque Central after a couple of hours. Or it could be compared to the Mercado adjacent to the gigantic, bus parking lot, masquerading as a terminal, in Antiqua, Guatemala. Here we could find, among the fruits and vegetables and almost all manner of things available in that country, the area known as la Paca (the Bale) which resembled nothing so much as a vast topsey- turvey Goodwill drop-off station turned on its head. But, Tarqui is unique. A reputable source guestimates that Tarqui is a rectangularly shaped twelve by fifteen blocks. While we’ve not walked the parameter that seems intuitively correct. 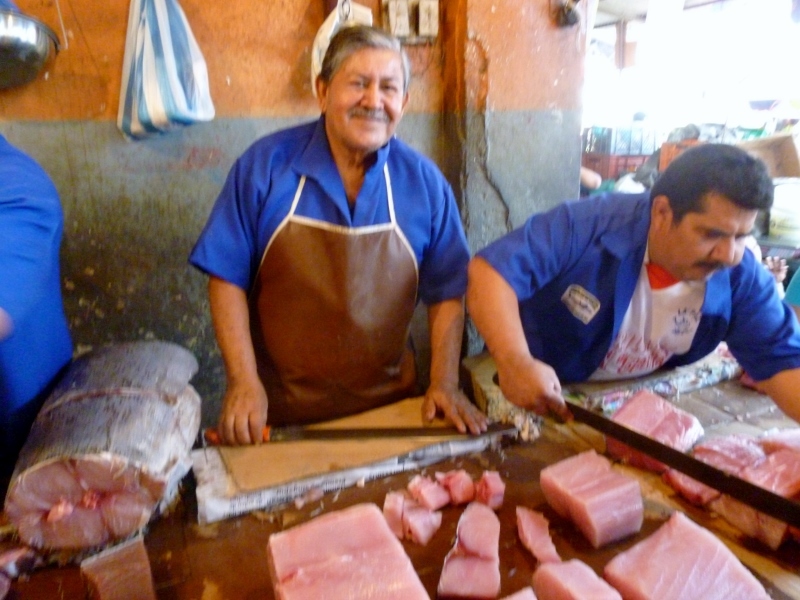 Tarqui serves as a market for the barrio, the neighborhoods surrounding it, as well as the city folk. 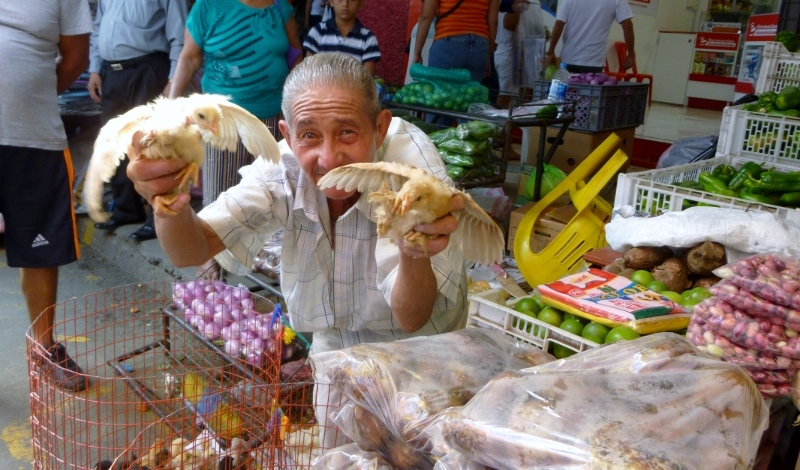 The street stalls offer to the passing throngs the bounty of this fecund province of Manabi in addition to the abundance of seafood from the Pacific. For the haggling aficionado, bargain hunters get an animated buying experience with plenty of smiles and shoulder shrugs as well as, in most instances, the cheapest prices in town. On a daily basis, seven days a week, live chickens and ducks, plucked chickens with feet still attached and a harvest from the sea arrive. The heart of the market is, of course, the produce. 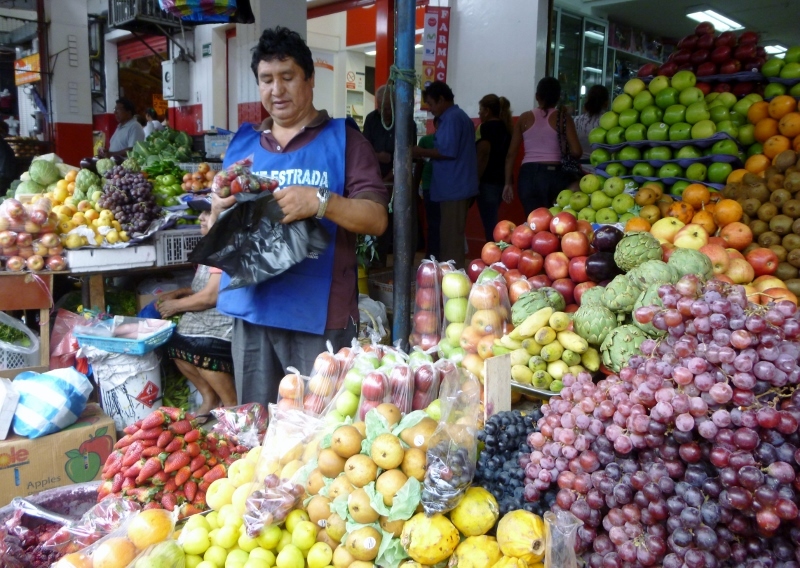 The vendors, some on the sidewalks but most abutted to the curbs, display their wares in stunningly colorful geometric piles and pyramids of fruits and vegetables. Incredible values are available; a bag of six green peppers goes for fifty cents. We pay another fifty cents for a bag of fifty to sixty whole, cleaned garlic cloves and are charged 75 cents for a large bag of thirty to forty radishes. A young man from the nearby town of Jipijapa (Hippy-Hoppa) sells large loaves of banana-nut bread, fresh and amazingly fragrant, baked by his aunt. This still-warm bundle goes in one of our backpacks to be consumed later with the best-ever, ginormous fresh strawberries. Into this teeming mix of buyers, sellers and lookie-loos which fill the streets, taxis and trucks advance with a slow determination. If you’ve ever witnessed a car drive though a herd of sheep or cattle on a country road you get the picture. It’s literally a game of give and take with the taxi inching its way deliberately through the teeming multitudes and ultimately gaining the upper hand as no one really wants a smashed toe. And then, as we venture beyond the produce vendors, who congregate near the major thoroughfare at the north end of Tarqui, we encounter the rest of the vast variety of merchants who sell bootlegged CD’s and DVD’s, clothing, plastic items, breads and pastries, car parts, stuffed toys, construction materials, kitchen items and on and on. Behind the vendor’s facades are the stores themselves and occasional alleyways that break the symmetry of the store fronts and allow access to an interior rabbit warren of more small shops, some of which have multiple entrances and exits, and all of which sell – guess what? – more of what is on the sidewalks outside. Of course, we have the option to shop in the several supermarkets dotted here and there throughout the city, such as GranAki, Mi Comisario and Super Maxi among others. Modeled after their western counterparts they offer ease and convenience in a sanitized package at, almost always, higher prices. And Tarqui, while similar to street markets in other Latin countries with an echo of having done this before, offers a slightly difference experience; maybe because it’s a different country on a different continent. But here, there’s a spirit of cooperation with buyers and sellers working together to make sure everyone’s a winner. Buying and selling goes on the world around, but this, friends, is commerce Ecuadorian style in Tarqui. Wow! Stunning market place. The food seems delightful. Is it open all year long, Anita and Richard? We went to the market at least once a week during our 3-month stay in Manta and, to answer your question, it was open daily, all year long. Sadly, a devastating earthquake in April of 2016 completely destroyed the commercial shopping district, the area where the market was held and several hundred people were killed throughout the region. Manta is still working on rebuilding but, knowing the people there, I have no doubt that a market is up back in the Tarqui or nearby! Great photos of the market goods with their vendors! Those look like giant chunks of sushi near the top. I must be hungry! A visit to the market with all its newly-harvested and colorful produce and seafood freshly caught only hours before is enough to whet anyone’s appetite and encourages some serious chopping in the kitchen! You’ve captured so many great portraits of vendors with their produce-that is not easy to do. Seeing a market when you arrive in a new location is such a terrific way to connect with the locals and get a feel for a location. I’m with you! Thanks Alison! It’s a lot of fun for us to bumble along in our Spanglish and bargain with the sellers. I’m sure they can see that we’re enjoying the experience and exchanging smiles and laughs accomplishes a lot in the communication process. I’ve never seen strawberries that big! I bet the fruit tastes heavenly. I love the photo with the colored umbrellas in it. All of the fruits and vegetables were beautiful but the strawberries really stand out both for taste and size. Absolutely the best we’ve ever had! That’s one incredibly colorful market! 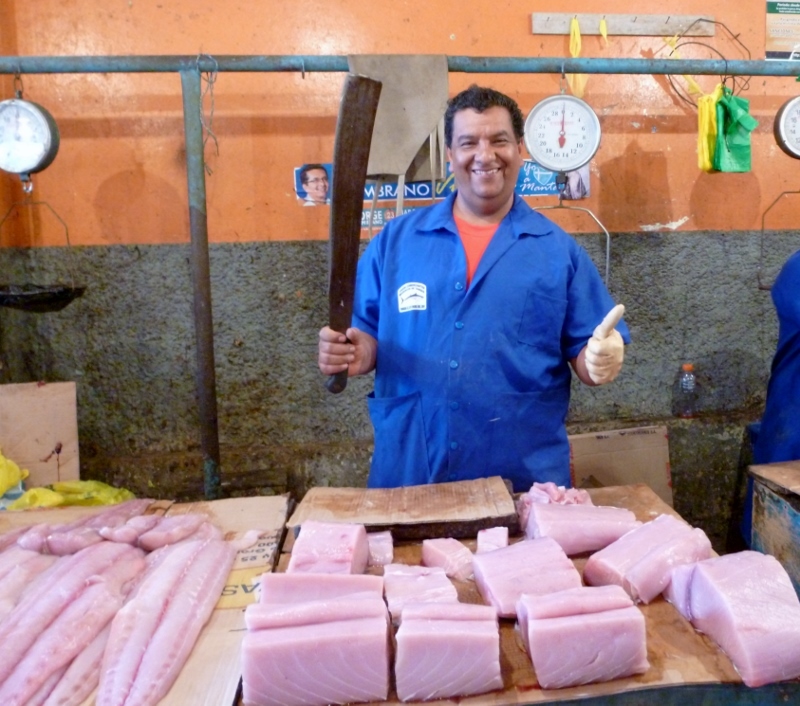 Looks like you can eat well in Ecuador, at least in Manta :-). 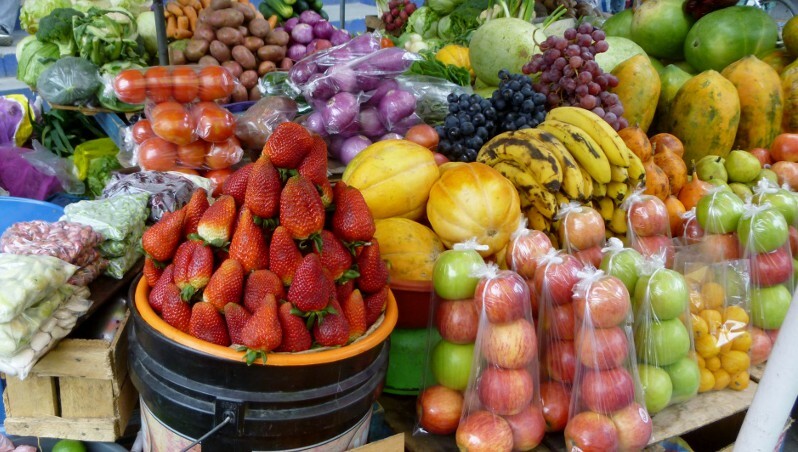 The availability of fresh fruits, vegetables and seafood is amazing and you’re right, you can eat very well in Manta for extremely reasonable prices. Markets are always so much fun to visit while traveling. Terrific photos! Thanks Sue! Since we’re retired slow travelers there’s no rush to run daily errands and we’re lucky to have time just to wander through the market and enjoy the experience of careful selection, bargaining and connecting with the vendors. We love the markets in Mexico! As long as we stay away from the tourist areas we find we great fantastic product at amazing prices. We have walked away from a local street market in a tiny town in the middle of nowhere with two full bags of fruit and vegetables for about $12 or $13, we love it! I really wish that the Farmer Markets in Canada and the US of A were more like these markets. Instead we find that you have to pay an arm and a leg to get the produce direct from the growers! I agree that the farmer’s markets in the US are nowhere near the bargains that we’ve found in Central and South America but the flavors and quality are usually much better. It’s also a good feeling to buy food at the source and know that the money will be going directly to the farmer rather than a corporation! I stopped by your post on the Jerusalem open air market and the Mahane Yehuda market looks fabulous with the gorgeous fruits. I imagine the scent of the spices adds to the exotic feel of the market as well as the many languages and accents. The markets are some of our favorite things about travel! 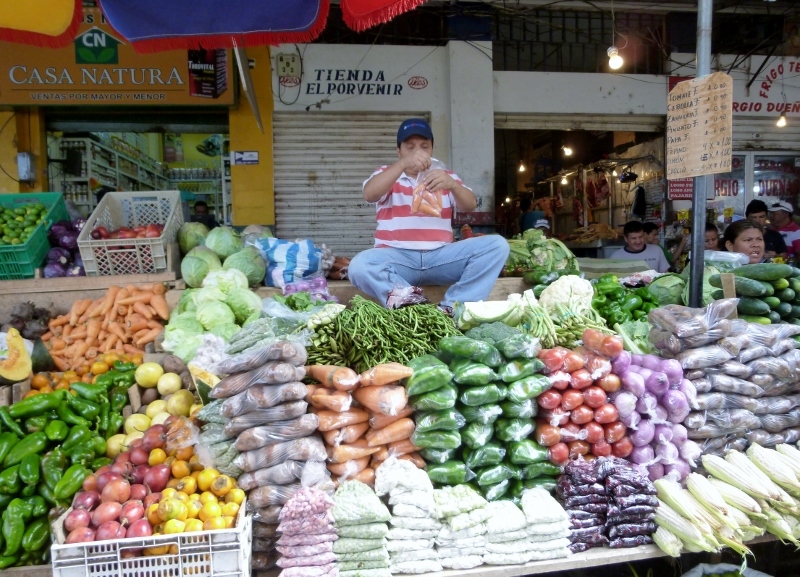 Loved your pics of the fresh produce market – the sellers take such pride in the presentation, don’t they. Nobody in Australia that I know of stacks strawberries into a pyramid – but they would in nearby Bali. The displays of goods for sale are beautiful and you’re right, we’d never see such care taken with arranging them in the US either. It’s so nice not to buy everything all packaged and wrapped tightly in cellophane and the taste… Wow! Market visits like this one are such wonderful ways to get in touch with the people and culture of a place! One of the real joys of travel is the chance to interact with people from different countries and cultures and the street markets are the perfect places. So much more fun than handing over money to the supermarket cashier! You have a real knack for connecting with people and getting them to pose or not for the best expressions. I too love street markets for getting close to the locals and what their cuisine is really about. Great post. Thank you. Most of the time we smile and practice our Spanglish or stop and admire a person’s displays before we ask if we can take a picture. So many of the people in Manta like to find out where we’re from as well as practice their English and most don’t mind hamming it up for the camera as well as seeing the results. It’s fun to connect and meet new people! What a fun article! And your photos are so colorful especially the man with the duckling and chick! The fruits and vegetables are arranged with such care into symmetrical piles that it’s hard not to appreciate the pride that the vendors have in the fresh produce that’s for sale. 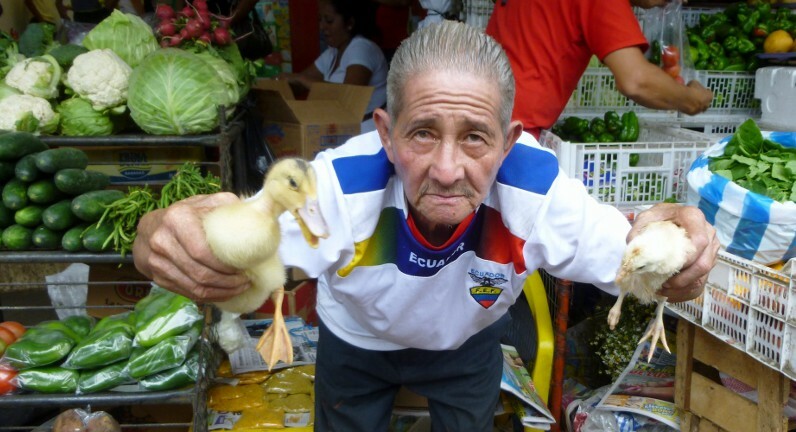 As for the man with the duckling and chicken, we’ve run into him several times and he always likes to pose and see our photos of him! Going to the local markets is one of the real pleasures of travel. Love it! We really enjoy going to the street markets and traveling long term and living as locals lets us experience the fun of shopping for our daily needs as well as interacting with the vendors. Love the vibe, the noise and the hectic pace of all the comings and goings. Love the pics. 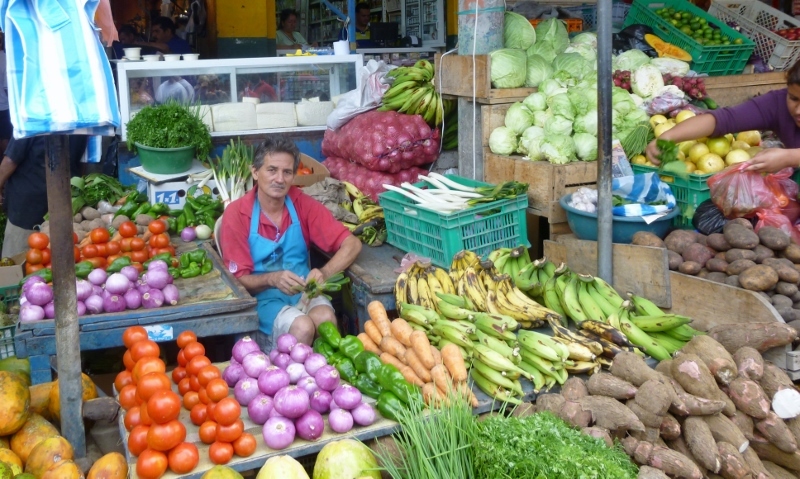 One of our favorite places in Manta, and we usually come home with bags and backpacks full of fresh produce. The produce is wonderfully fresh and it’s amazing to set our stuffed full sacks on the counter and see how much we’ve bought for so little money! We tend to prefer shopping at open air markets no matter where we are. If I were close to Jipijapa I would absolutely have to visit the village! Open air markets are entertainment in themselves and it’s so fun to walk around and people watch as well as find what you need. We love the interactions that occur, too, with the bargaining and just saying hello! 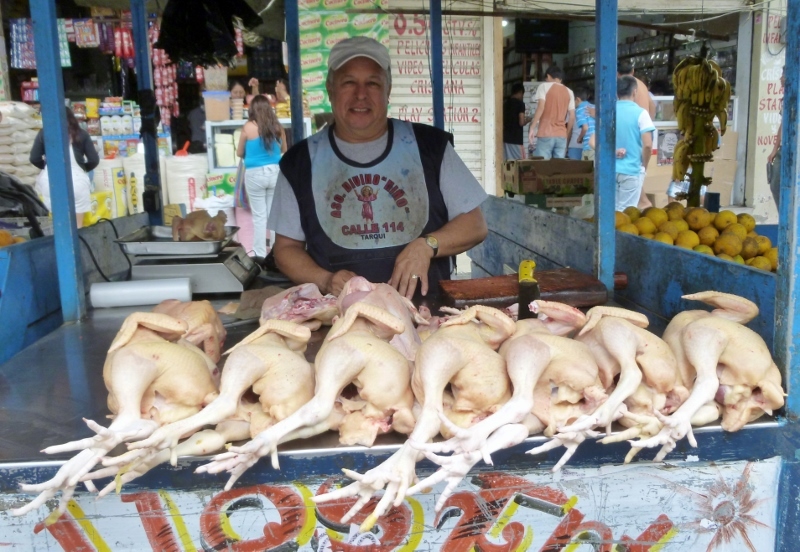 I love markets in South America! And usually they offer fresher food for much lower prices than supermarkets (I wrote an entire blog post about it with price comparison!). I specially like the care with which they set up the stalls – just look at those tomato pyramids! The prices can’t be beat and the taste is unbelievable. I have NEVER had strawberries as big or as flavorful as I’ve had here in Ecuador and the other produce is just as wonderful. And you’re right about the attention that goes into setting out and displaying their wares. It’s easy to see the pride that the vendor has with what they are selling. We managed to bump into the gentleman two different days and he hammed it up both times when he saw my camera! In the first photo he has a duck and a chicken and in the second photo he’s posing with chickens. As for becoming vegetarian … it’s definitely easier to enjoy your meal when you don’t see a face attached! We always keep an eye out for him as he loves to pose for the camera and see his photo. Running into familiar characters makes the jaunt to the market so much fun!